After four years at Binghamton University, the seniors know it all! Below you will find the thoughts and sentiments expressed by some of this year's graduates. 1) How has your collegiate experience at Binghamton University affected your Jewish identity? 2) Which event(s) were most memorable / meningful / helpful / enjoyable for you as a Jew? 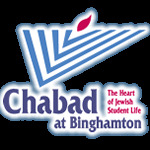 3) How would you describe the role of Chabad within the greater Jewish experience at Binghamton UNiversity? 4)What would you like to see changed / added in terms of Jewish life on this university?